After a wonderfully busy holiday season, my mind started to turn towards thinking about what next to add to my catalog to start off 2015. 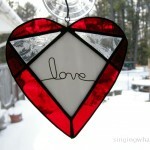 With Valentine’s Day, on the near horizon, I started contemplating stained glass hearts and roses. Roses may still yet come once I get some photos from which I can play with making patterns. Hearts, on the other hand, were easy to get started right on my computer. 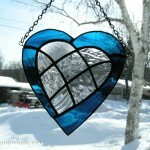 First, I spent a full day looking at other stained glass hearts on the internet to see how other people were rendering them. My goal is always to be mindful of other people’s work so that I can create something that is more my own, unique and different from other work out there. In an effort to try to be a little bit different and diverse in the offering, I made 3 different patchwork patterns. Two are variations on each other, differing in number of pieces. The smaller number of pieces lends itself to a sort of argyle feel, especially in looking at one of the samples I did, using purple artique and olive green streaky glass. The other two samples in that pattern are with rainbow colors, one randomly placed and one a bit more orderly. Then the more involved patchwork piece came about, offering a lot of potential for random color placement. 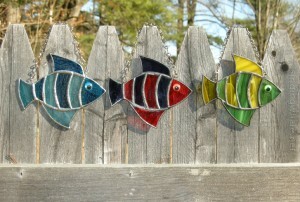 I did a cool colors sampler, and one in various textures of clear glass. 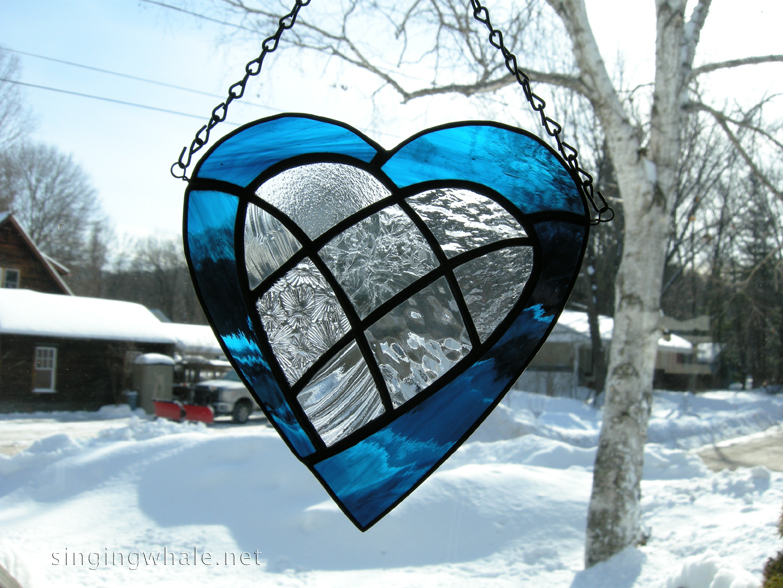 The clear glass piece has garnered a lot of interest, so I expect to be stocking up on more textured glass so I can make a variety of stained glass hearts with the clear textures, randomly arranged so that each finished piece is different. The third patchwork piece is a bit more avant garde. I had a ball planning the colors and layouts of the first sample, but it remains to be seen how popular that one will be with buyers. I may make a couple more samples with different colors and arrangements to see how else it can look. For the other patterns, I came up with two variations of what I call an inlay heart. 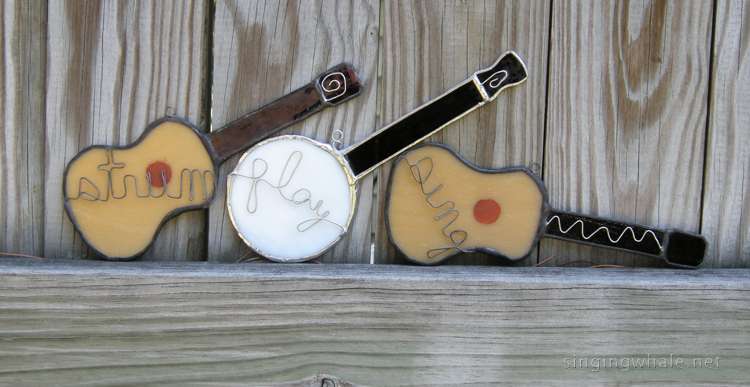 After a Facebook post in which I wondered aloud if people would be interested in hearts in glass, several people commented that I should incorporate the wire words that I started to use on the guitars and banjos. So I designed the heart within a heart for one, and another heart shape with a larger open space in its middle, using straight lines to create a pattern within the piece. 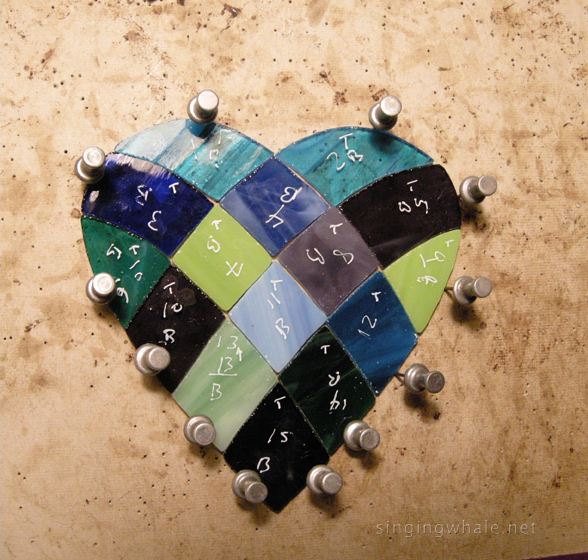 For the inlay heart, I am going to tweak the pattern to make the outer heart a bit bigger and more full, but I am otherwise pleased with how it turned out. 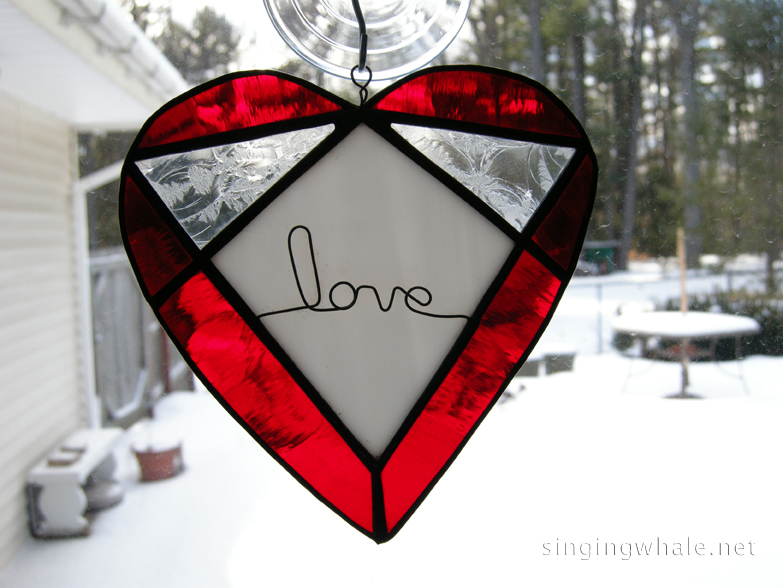 For the heart using straight lines to give it its look, I first went for a cherry red waterglass outer edge, clear glue chip glass for accent, and white for the center. 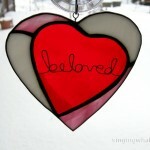 It can certainly be done in just about any color variation depending on what someone wants in their own window. I am happy with how all of the samples turned out, but also know that a couple of the patterns are likely to be more popular than the rest. 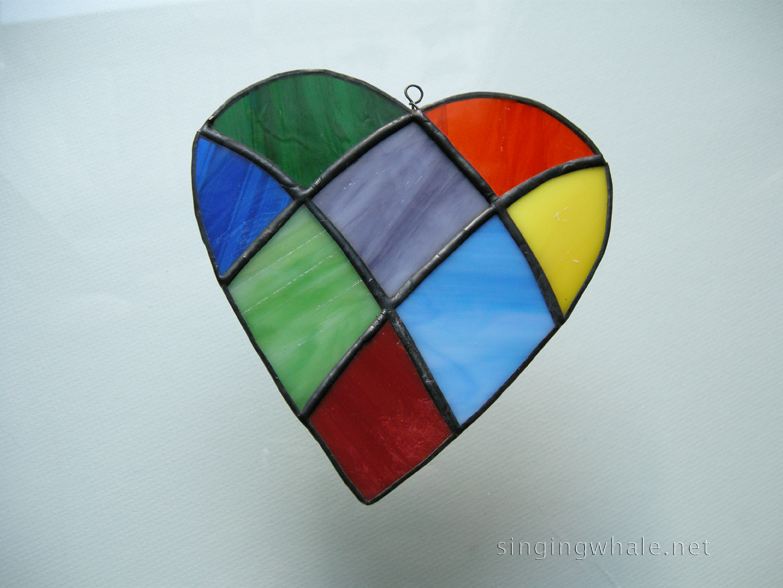 Judging by the response on my Facebook glass page, the early ‘leaders’ are the inlay heart-within-a-heart which can host a wire word in the center, and the 15 piece patchwork heart. 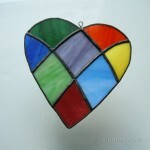 Check out the gallery of the first finished stained glass hearts. as I do more variations, I will add photos to it. To order or inquire about any pieces, just contact me. Thank you! It’s been a while since I have really made a new pattern. There’s always something percolating (and a few other things are swirling in the mind right now), which means there is usually a fair amount of incubation from the first thought through to the first sample pieces. That was not the case with this one, which came together very quickly. 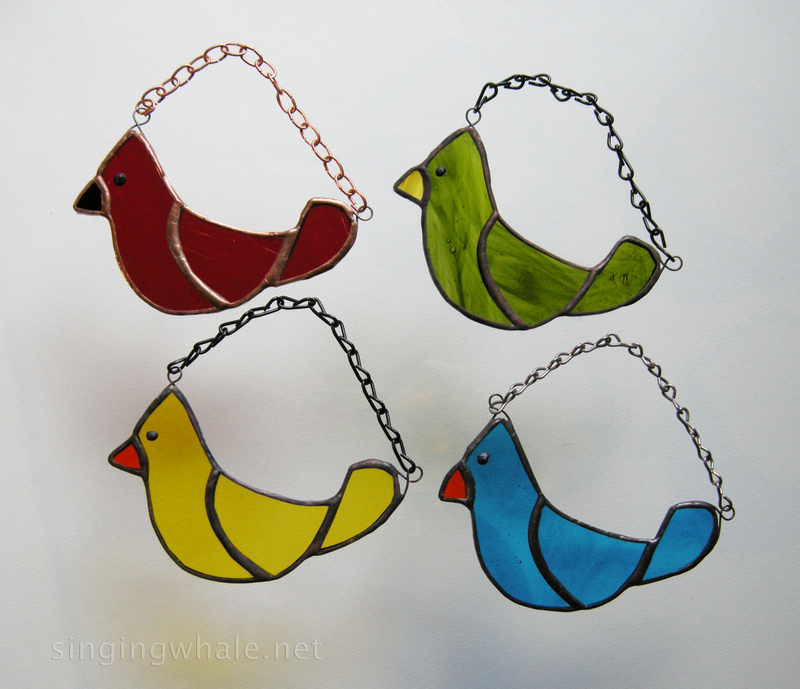 My fellow folkie friend, Kat, saw me post on Facebook about adding new colors to the small bird ornaments I make. Previously done only in blue and red, I’m now making them also in yellow and green. As a fan of They Might Be Giants, Kat mentioned that the little blue birds reminded her of one of their songs, Birdhouse In Your Soul. 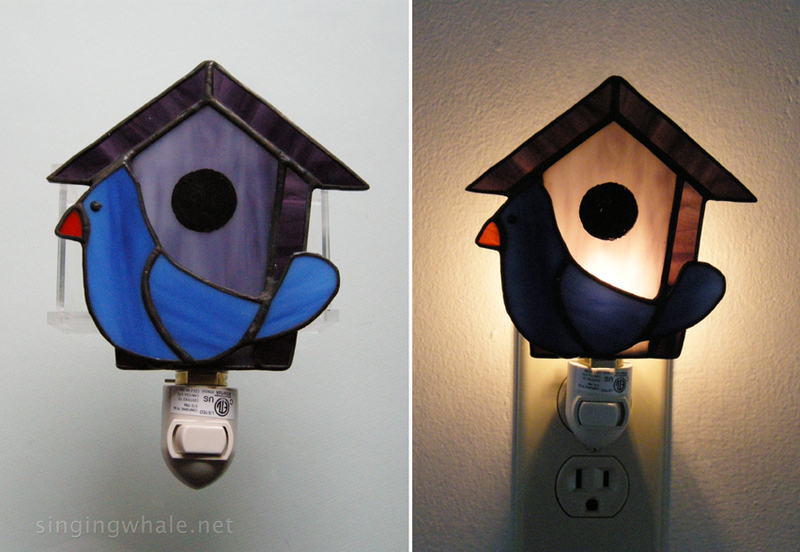 She had gotten a plastic blue bird nightlight some time back, but it had broken, so could I make one of my glass blue birds into a nightlight? Unfamiliar with the song, I went and looked it up. 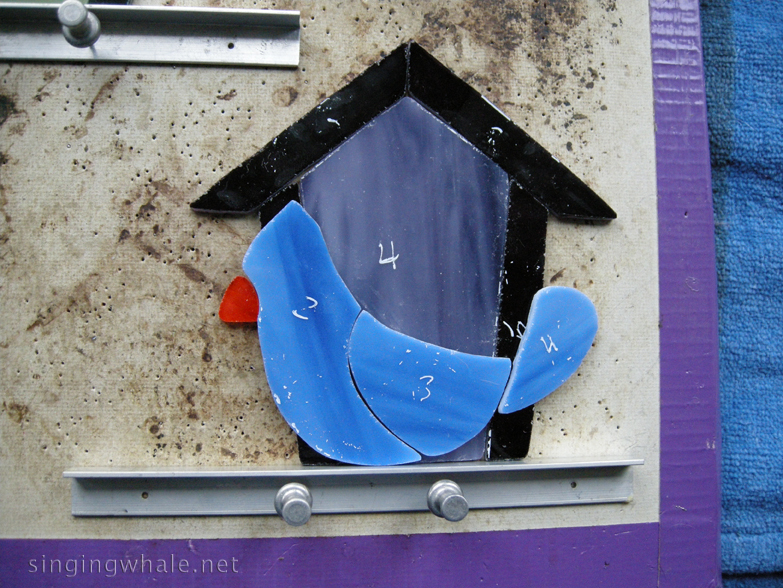 My glass bluebird itself was not, to me, enough to make a decent nightlight, BUT – since a birdhouse also figures into the song prominently, it made perfect sense to build the nightlight with both elements. I am pleased with how this first round has turned out. 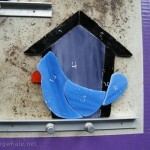 I opted for a more opaque blue glass for the bird so that the birdhouse colors behind would not change the color/look. My personal preference in a nightlight is NOT to see the bulb too clearly through the glass when it is lit, so I also like to pick more translucent glass for the parts going right over the bulb. 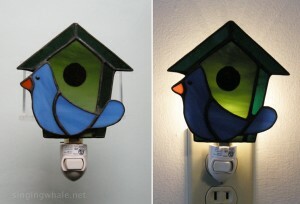 For these first two nightlights, I went with a forest green wispy glass outlined by a dark green transparent glass. I also had a similar purple wispy I used for the center of the other one. with a purple wispy waterglass used for the outer edges of that one. 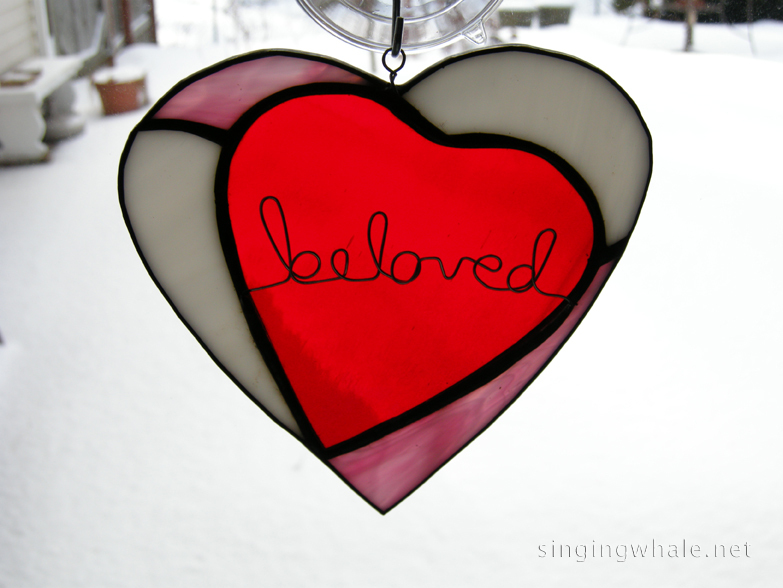 The hole is made with black enamel paint, baked onto the glass. 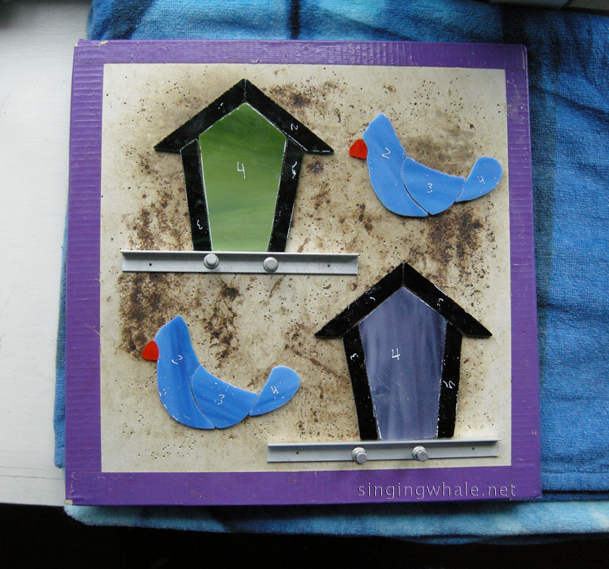 When I get more nightlight works, I am going to play with more color combinations on the birdhouse, and also birds of other colors. While this was inspired by Kat’s mention of the TMBG song, the nice thing about this pattern and piece is that it has great potential for versatility and appeal for anyone who likes birds and birdhouses. Ultimately, this project came together in about 2 days. I wish all of my new pieces were that easy to get from thought to fruition. Thank you, Kat, for getting the ball rolling! These will sell for $30 each. They measure about 4.5″ at the widest point, and also 4.5″ at the longest. Want one? Get in touch, and thanks! I love music made on guitar and banjo. I’ve been a folkie since I was a kid, growing up listening to John Denver, Judy Collins, and the Clancy Brothers with Tommy Makem. As an adult, my music collection grows on a weekly basis, and earlier this year I started a blog dedicated to highlighting acoustic/folk music, Freelance Folkie. In the glass world earlier this year, I saw some examples that someone had done of writing out words using wire. I was quite intrigued by the idea and kept simmering about it as I considered applications, pieces on which I could use such words. I bought a notebook, started writing out a few examples in cursive (which looks much neater than my usual scrawl I call handwriting), then left the ideas under the radar to see what might develop. And along it came, that eureka moment when multiple ideas came together. 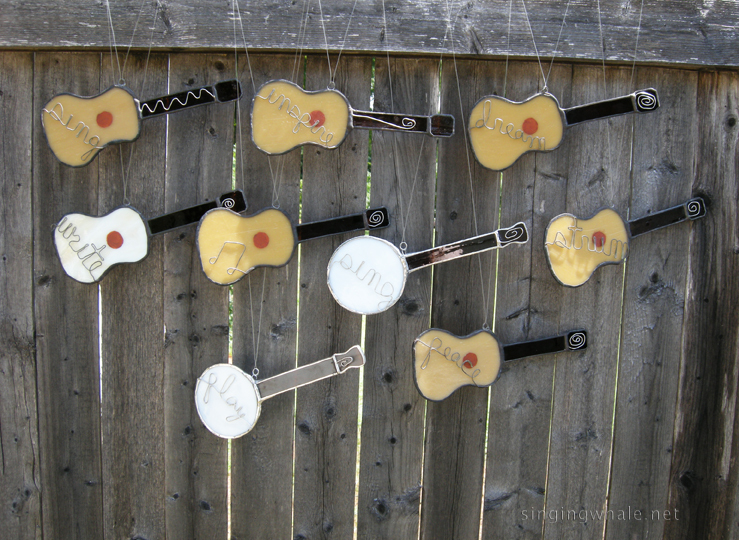 It became a completely sensible notion to make guitars on which I could put wire words. The notion grew a little more as I decided also to try a banjo. Of course, I can’t make just one or two samples. Over about 4 days, I had recreated a guitar pattern large enough to have words fit decently, created a similarly-sized banjo pattern, and set about to making pieces. When I was done, I had 7 guitars and 2 banjos to get the idea off the page and into reality. 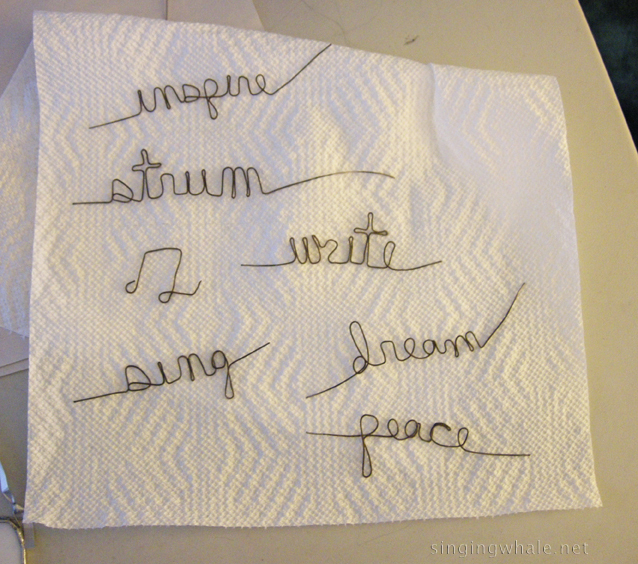 Writing wire words is an engrossing process. It will take some practice to get some letters to look better and better, like the letters p and g, and others with loops in them. The letter t presented its own challenge. 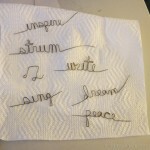 I am pleased with how my first efforts turned out, and feel confident that I can continue to refine this skill and make a wide variety of words to fit on these instruments. I had a chance to employ another new technique as well, using enamel paint to make the sound holes on the guitars. 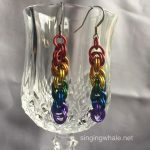 This gave me not only some new pieces for my repertoire, but also grew my glass skills, which makes this a successful endeavor in multiple ways. I am pleased with the end result, and I hope others enjoy these as well. The guitar measures 7 inches long by about 2.75 inches across at the largest point. The body of the pieces is a lovely amber brown, with transparent dark brown used for the neck and headstock. I played with a few different possibilities for decoration on those two darker pieces, and I welcome feedback for what works or did not. 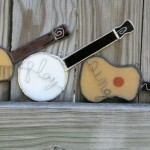 The banjo is made with a wispy white for the body, and also dark brown for the neck and headstock. I did details only on the headstock on these, and I think I actually prefer that look, personally. The body of the banjo is 2.75 inches in diameter, with a total length of about 7.25 inches. All of the pieces are set to hang on about a 40-45 degree angle. The guitars have been finished with a black patina on all but the headstock/neck embellishments. The banjos are in the original silver finish, polished to keep the shine. Please let me know what you think. Decorations or not on the neck and headstock? What other words would do well on these instruments? I’ll be selling these for $20 each, plus shipping. If you want one, let me know. Check Etsy for listings there, as well. 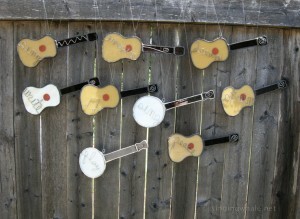 I hope you will consider adding a guitar or banjo to your own window! 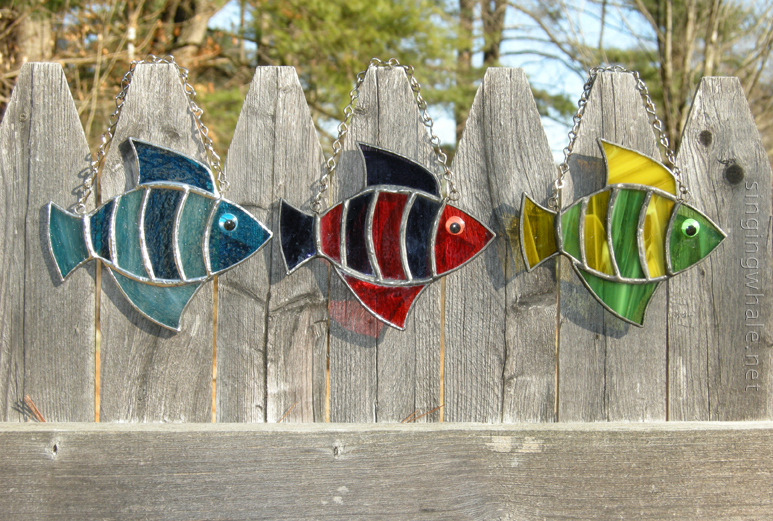 To see more of the prcess that went into these, and individual photos of the finished pieces, please visit the Stained Glass Guitar and Banjo Suncatcher gallery. Recently I started thinking about adding something to my catalog that might be appealing to religious folks. I wanted to do something a little bit different from what I have seen from others, just to stand out a little bit. My first thought was a symbol popularly known as a God’s eye. Like probably millions of kids, I had made at least one out of yarn and popsicle sticks when I was younger. Somehow, it has always stuck with me, despite not being especially religious, myself. 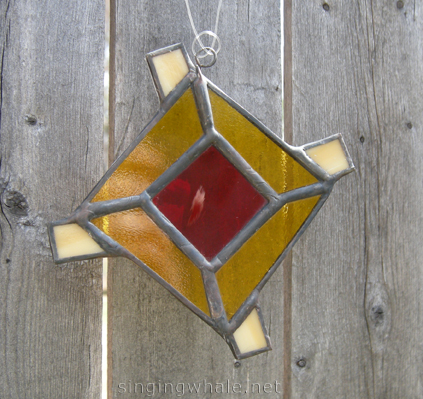 Small God’s eye ornament in red and yellow. Next, I did what any nerd would do, I Googled it. 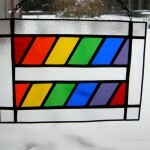 I discovered that there are not many representations of it in stained glass. And I learned that it has a much deeper history than I had ever realized. It is not a Christian symbol in its origin, but instead hails from the Huichol Indians of Mexico, a tribe originating and residing in the Sierra Madre Occidental Mountains of central northwest Mexico. Their spiritual tradition is nature-based and polytheistic. In a conversation with the head of The Huichol Center for Cultural Survival, I was told that the God’s eye symbol, also called Ojo de Dios, has been incorporated into many belief systems around the world. Learning as much as I did about the symbol, I felt increasingly drawn to it and felt challenged to make a faithful and respectful representation of it. The four points represent the basic elements of earth, air, fire, and water. The eye is meant to offer protection, especially for children, as well as a connection to the power and mystery of the unknown. The connections that the Huicholes have to the land and sea resonate deeply with me as someone who also is concerned about and interested in our planet. In typical fashion, one sample is not enough so I created two patterns and six pieces. 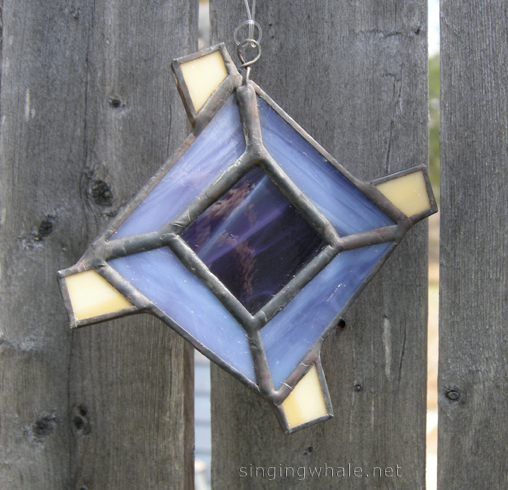 One pattern is a ‘full size’ sun catcher at about 6 1/4″ in diameter, and with three layers. 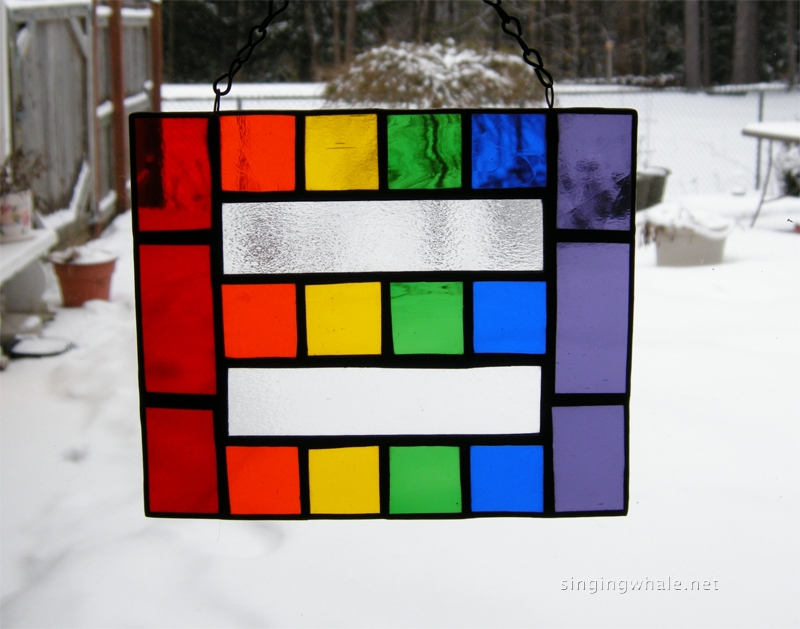 I also made a smaller, ornament-sized version with just two layers which measures 3 1/2″ across. Each hangs from a hook. 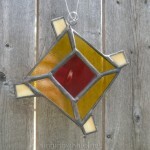 As it turned out, I had some terrific glass choices for the first samples of the larger sun catchers. 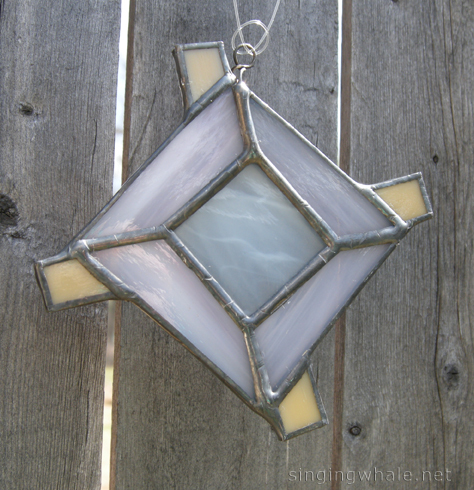 I use a lot of wispy glass in many pieces, meaning a single color of glass with white lightly swirled throughout. 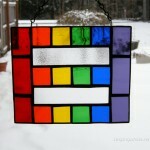 Very commonly, the edges of those sheets of glass have the primary color and white together in a straight pattern. I realized that this mimicked the texture of some yarns. Since so many God’s eye pieces are created in yarn, this seemed a great way to start these first pieces. I am pleased with how those turned out, and will be looking out for more such glass as much as I can, and use other colors/textures in the meantime. 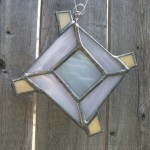 First samples of the God’s eye/Ojo de Dios pattern. This is the larger version, at 6 1/4″ across. The larger God’s eye is $30, and the ornament size is $15. Please let me know what you think, and thanks for reading! It is an ongoing process for me to try and develop my own owl patterns. For one thing, most of the ‘stock’ or free patterns of owls strike me as being either cartoonish or mean looking. Plus, I really want something of my own, something unique to put out there. Given that freehand drawing is not my strong suit (there’s a reason that many of my patterns start as photographs), this would be a challenge. I have spent hours searching for and looking at owl photos of various species to get some ideas, playing around in Photoshop with line drawings. Nothing was quite coming together. First owls made, first generation of eyes. trying various things to see what options work best. And then one day, in a flash from some mysterious muse, I got an idea for a simple but recognizable owl face. I managed to create/draw a pattern in Photoshop for it. It’s not perfectly symmetrical but I actually like that about it. That adds a little bit of a sense of whimsy and uniqueness. I did the pattern in two sizes, a small and large, thinking the smaller size would be good as an ornament, especially. These faces, I made back in December and just realized I had not posted about them yet. The larger owl measure 4.5″ wide by 3.5″ tall. The smaller owl is 3.5″ wide by 2.5″ tall. I’ve been experimenting with eyes, somewhat, securely gluing various materials and pieces into place because adding eyes *in* glass results in a lot more pieces, seams, and work, where the idea here was to be simple and recognizable. So I am using googly eyes on some, and flat washers with the pupils of googly eyes that I have cut free on others, and some small globs for the smaller owls. I think the washers combination will be the predominant way I will do eyes going forward but I may still use googly eyes when I am in a silly mood or they are requested. The owl on the left has brass washers for eyes, and the one on the right has zinc washers. From the creation of this owl face pattern, I recently had an idea to grow it into a unique nightlight pattern. 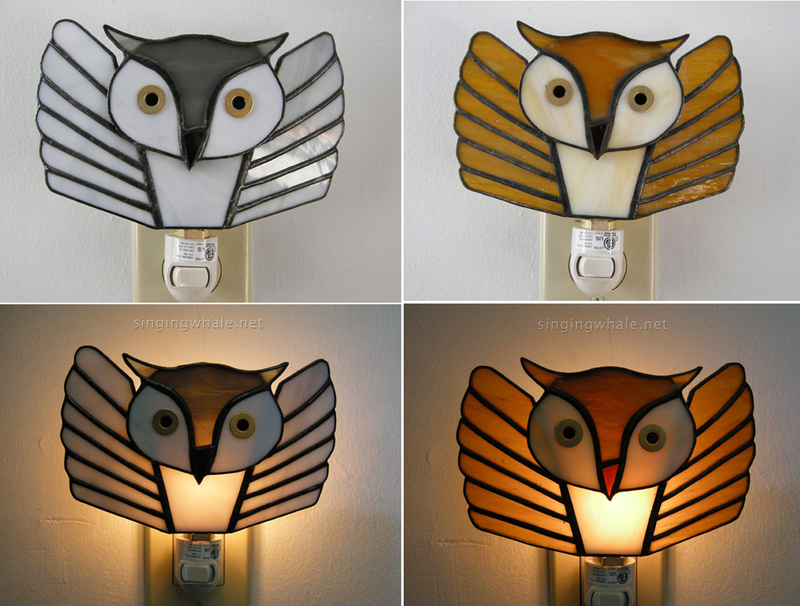 Searches for glass owl nightlights turned up nothing along these lines so I was off and running. The goal was to create wings for the sides of the nightlight, creating the sense of flight. The small owl face from the previous design round was a good size to fit on the base. I modified the center piece of a standard night light backs patterns to allow for a better attachment of the face to the back and keep it securely joined. And then I developed a wing pattern to go on each side. 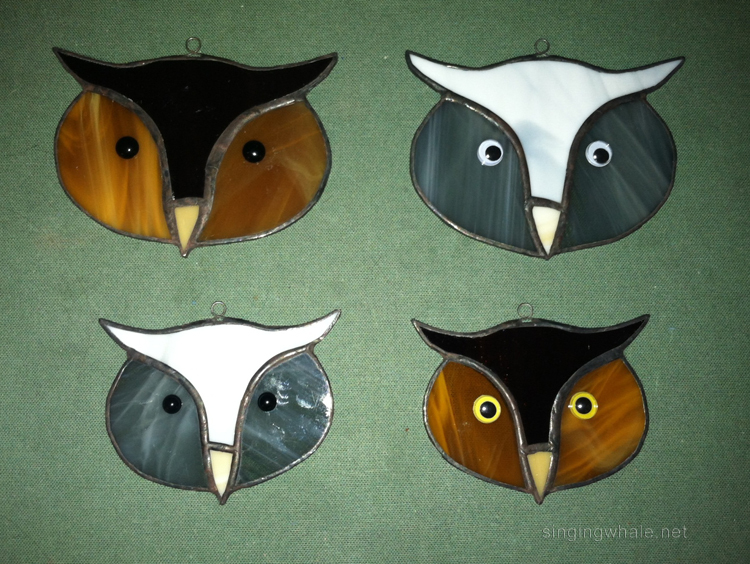 The first two samples I made are a snowy/white owl and a brown owl. I am really pleased at how these turned out! I’ve since made a red and pink one by request and am looking forward to seeing what other color combinations I can try out. 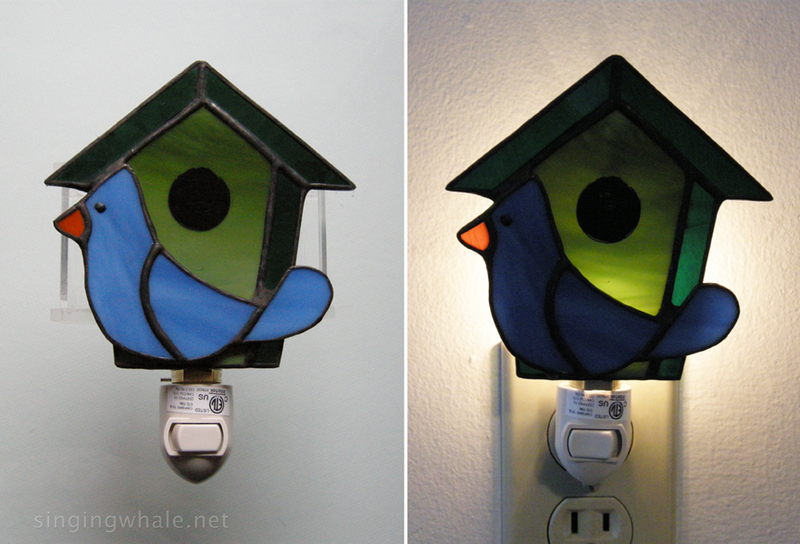 The glass on the nightlight is 6.25″ wide by 3.75″ tall (height does not include the night light base. With that, height is 5.75″). Prices as of this posting (subject to change in the future – current prices will always be listed with photos in the gallery): small owl face, $10. Larger owl face, $15. Flying owl stained glass nightlight is $40. Shipping additional in all cases. Perhaps more and different owls will also come along someday! 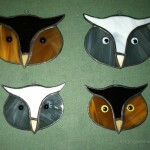 First two flying owl stained glass night lights, for a white/snowy owl and a brown owl. Though I have only just started watching Doctor Who, myself, I seem to know a lot of Whovians, and have seen a lot of related merchandise, tchotchkes, etc from the show. 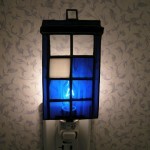 One of the most enduing and oft-used icons is the Tardis. This is the vehicle in which they get around, and it seemed easy enough to render in my own stained glass patterns. 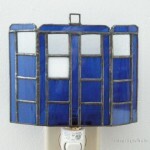 My first thought was to offer handmade stained glass Tardis nightlights as I had not really seen that out in the market as much. My motivation was to offer something a bit unique. After soliciting opinions from a few Whovians, I wound up with two patterns and made each. This is the best way for me to figure out what works and what doesn’t in terms of what I feel comfortable making again. The end result is one I will gladly make again, and one I plan to retire. The ‘keeper’ Tardis is a little bit wider and so the long skinny pieces are easier to cut and maintain an essentially straight edge (harder than it sounds with the grinder). It also allows for two versions, with sides (pictured, above) and without. Because of considerations for weight of the glass on the night light works, the smaller size of these projects really makes a difference for the two patterns. 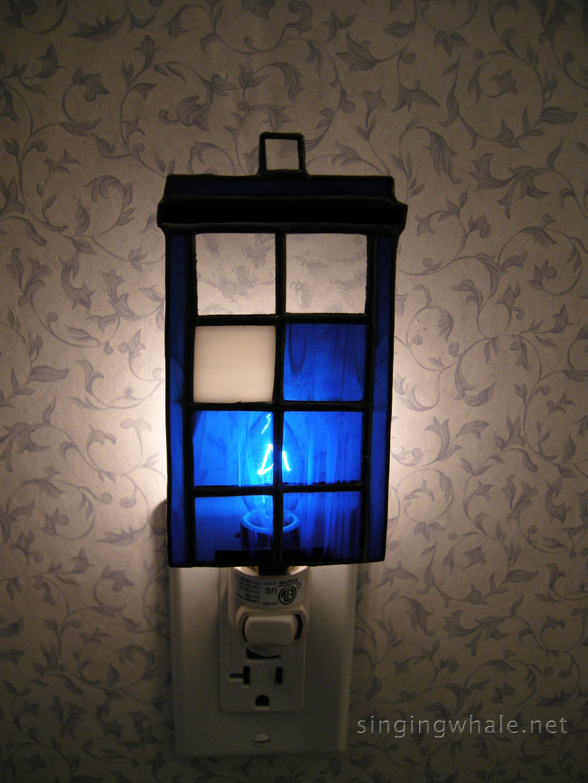 The front panel of the ‘keeper’ night light measures about 3.5″ wide and, including the light on top, 4.75″ tall. The side panels are each about 1.3″ wide and about 4.5″ tall. It costs $45 as seen, $35 without the sides, plus shipping. 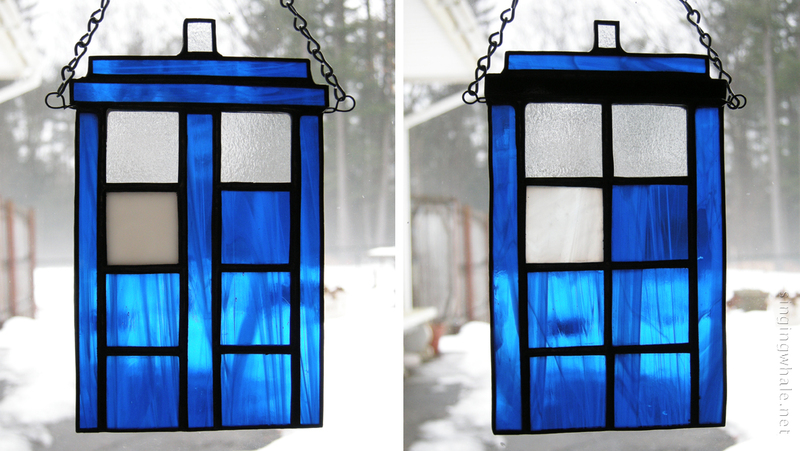 And then, I also decided to make a couple of Tardis suncatchers. First, not everyone wants, needs, or likes night lights. 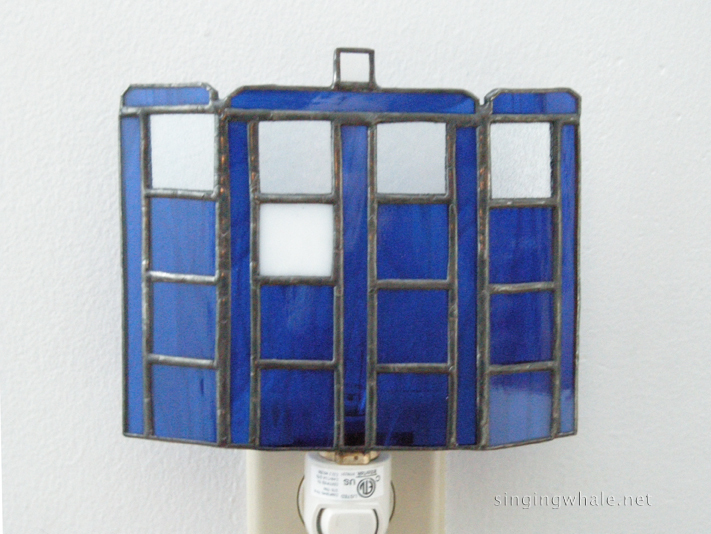 Making a suncatcher additionally means I can make the pattern a little bigger, which makes the skinnier Tardis a lot more comfortable to make. 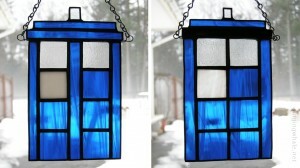 So here I present two Tardis suncatchers, both available for order. The one on the left is just under 6″ long (including the light) and 3.75″ wide. The one on the right is just over 6″ long and about 3.5″ wide. Each is $30 plus shipping. 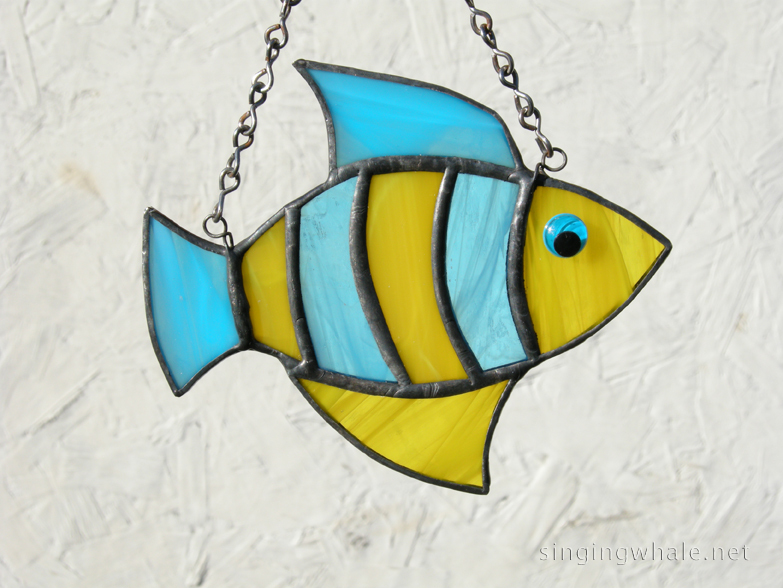 Hanging chain and a suction cup are included with each suncatcher. You can see a few more photos in the Tardis gallery. And if you would like to order one, don’t hesitate to get in touch. Thanks! 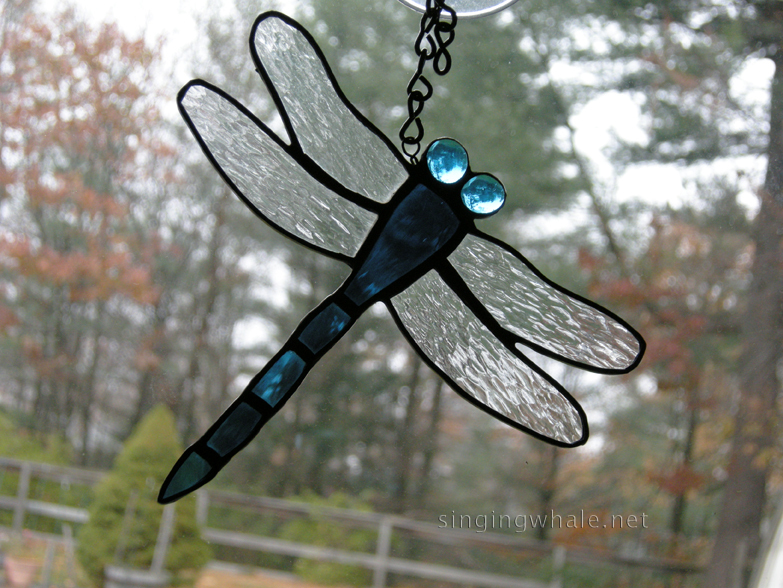 There’s no particular reason why I have not done stained glass dragonflies before, but I have gotten many requests for them. So I finally worked up a pattern and made my first samples this week. The fun part about working up any new pieces is playing with glass colors and textures. I sat down to make one or two pieces, but when I started to pull out glass, I wound up with 10 by the time I was done. After consulting the all knowing Google Images to see the impressive variety of colors in which real dragonflies appear, it was easy to keep growing the pile of glass I could use. 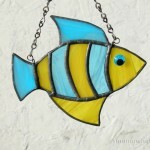 And I am already thinking of new glass to buy which can also make for beautiful new pieces! 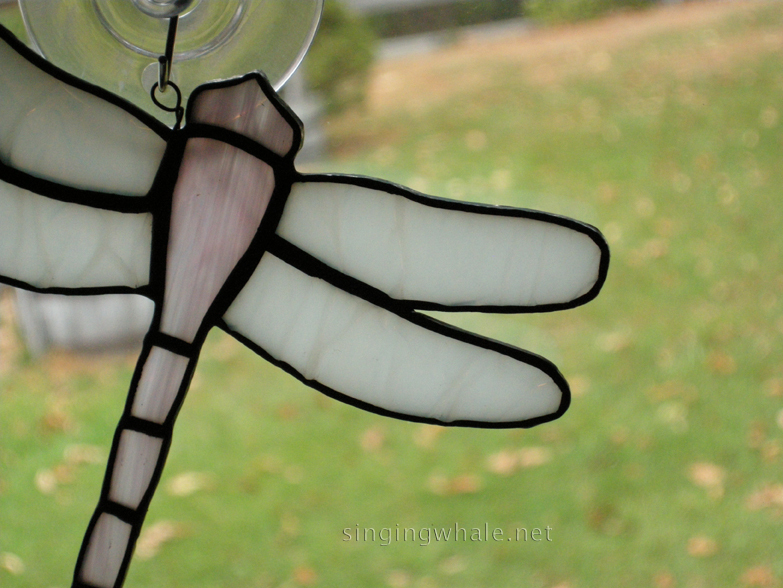 A couple of months back, when I was picking up some other supplies at the glass shop I most often frequent (Detailed Stained Glass in Concord NH), I found that they also had a neat translucent white glass which just screamed “dragonfly wings”. It’s Spectrum’s Firelight Krinkle (according to the sticker on the glass) for anyone curious. 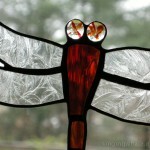 I started out with the plan to use that glass for wings. As I pulled more transparent colored glass for the bodies, though, the white seemed too strong, so I also looked at clear glass possibilities. Wound up using some clear glue chip, hammered, and clear satin textures. The other aspect I was keen to explore was the notion of eyes. Because I’ve also started making cat faces (which will be covered in another post along with some other new patterns), I have been stocking up some smaller globs. I was most intrigued by the clear ones with either yellow or red cat’s eye style irises in them. Not all of the samples have eyes as I don’t have small globs in all colors. Decided to also do a few dragonflies with a ‘regular’ head, just to see how it would feel to cut those, and how the finished pieces would look. I like both styles! 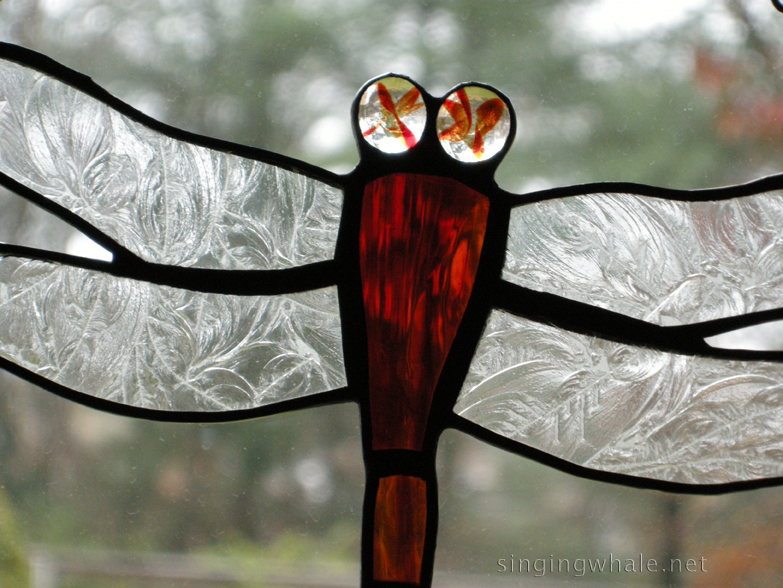 The end result is a variety of glass colors and textures used to try out a couple of variations of the pattern for stained glass dragonflies. They are 6.25″ wide and 5.25″ long. Talk a walk through the stained glass dragonfly gallery and tell me – what do you think? 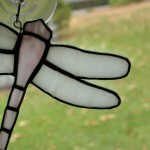 I’m also happy to make custom dragonflies with the colors of your choice. One of the very best things I got to do while a student at Wellesley College was to be a member of the Wellesley College Shakespeare Society. This is a small troupe of all women which produces and performs one of Shakespeare’s plays each semester. We play all the parts, in a delightful contradiction to Shakespeare’s day when men did the same. The bond we form as members is a lifetime thing, carried along and made stronger still by all who have come before and after. 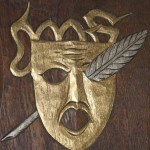 Our sort of de facto logo for the Society is a mask and quill. 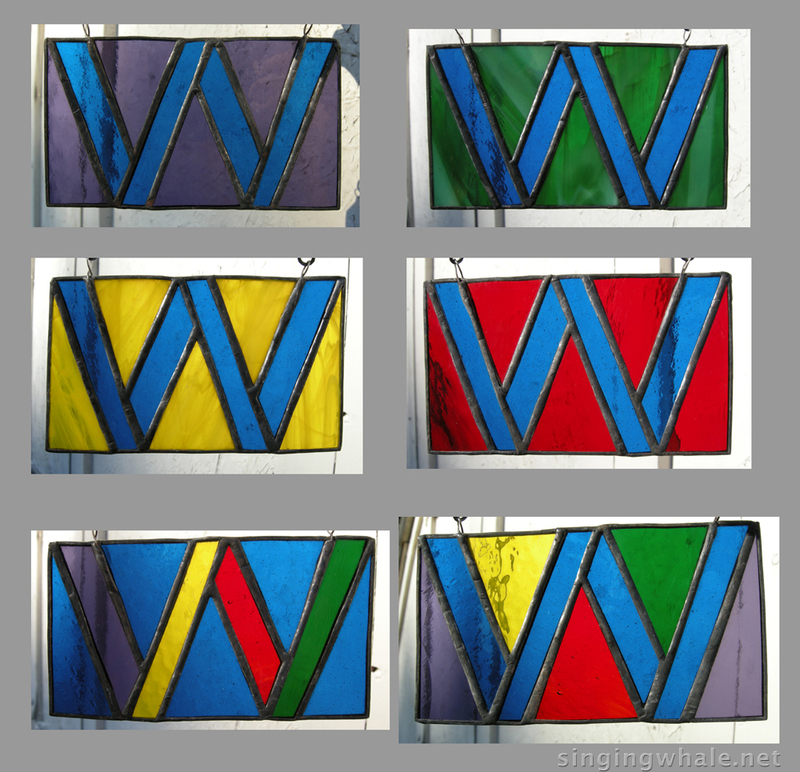 After making a more general Wellesley stained glass piece, I’ve been wanting to make one what would also represent Shakespeare Society. As you can see in this photo of a wooden plaque version of the icon, there’s some ornamental decoration along the outside edge that was giving me pause. 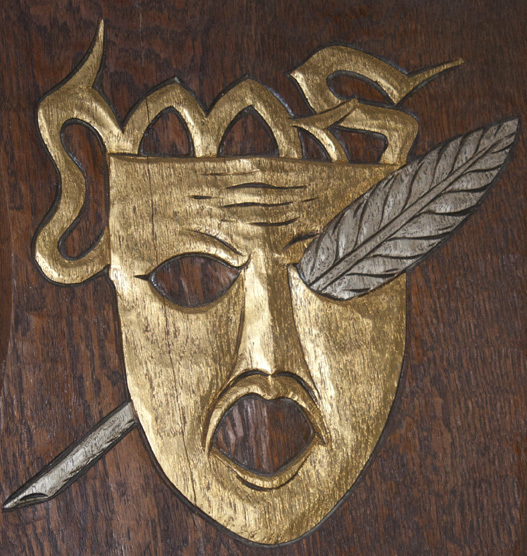 After talking with some Shakers at a recent event at the House on campus, it was collectively agreed that the mask and quill itself was sufficient for a glass piece. That’s all it takes to give me a new shiny thing, and I didn’t waste any time in starting to work on a pattern. In the end, it turned out to be a relatively uncomplicated pattern to make. The quill tip is in grey glass, and the feather of the quill is a perfect use for baroque glass. I polled a few Shakers for color, and both burgundy and a sort of gold were suggested. Since glass doesn’t really come in gold, and yellow felt too far ‘off’ to me, I also did a sample in light wispy amber glass. Seems a very good fit. The open eye and mouth are done in this samples with Clear Satin glass. Provides just a touch of texture to be more than ‘plain’ clear glass, but also still easily suggests the voids that are in all representations I have seen of the Mask and Quill. 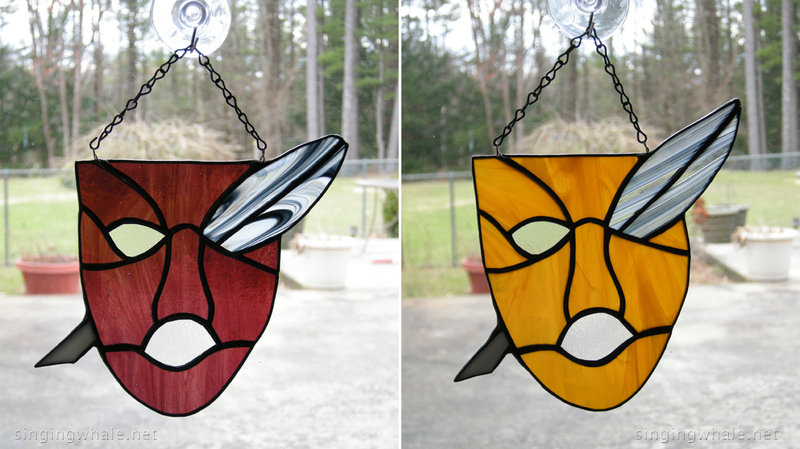 While this mask and quill stained glass piece was designed and made with a very specific group of people in mind, it could certainly appeal to any fans of the Bard, and of theater in general perhaps. Let me know what you think! They are $30 each plus shipping. Had some requests for a couple of other colors in the masks, so made more. Am attaching a photo here to show more of the variety in which masks can be done. 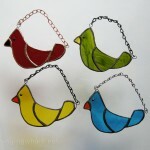 I am pleased that they are proving to be fairly popular! Inspiration comes from the darndest places, sometimes. I was looking at a page of rainbow, equality, and tolerance bumper stickers recently, when one of them really caught my eye. 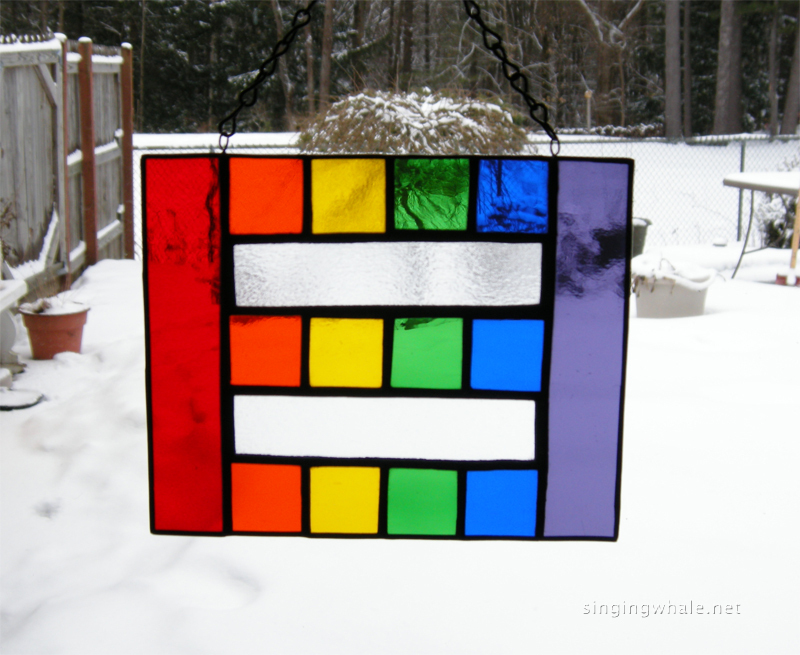 Decided to use it as a starting point to design a rainbow stained glass piece, using the rainbow to be the equality bars in the piece. 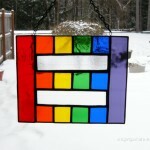 That, in turn, led to an alternate rainbow stained glass piece also for equality, but in reverse, with the rainbow colors surrounding two clear glass bars to represent equality. I did a little tweaking on the first pattern. My initial effort was a little too small to be practical, and didn’t look as balanced as I had hoped it could be. Things look a lot different on paper than when they are rendered in glass! I have a tendency to start small and then wind up having to make it bigger. Same thing happened when I made my pattern for the rainbow peace sign, also inspired by something similar I saw on line. I am happy with the second run on this pattern, with borders of equal width, also matching the clear bar in the center. 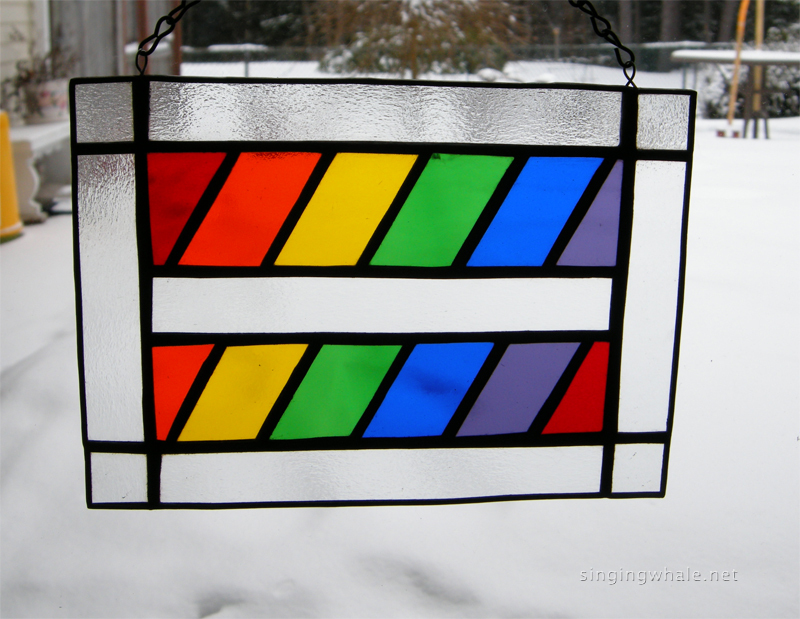 I went with clear glass rather than any color, including white, because I really wanted the rainbow colors to stand on their own. I did use a textured clear glass to give it a touch more depth. The final piece measures 5″ by 7″. Because the red pieces on the ends get sort of short shrift in real estate compared to the others, future constructions of this could easily have a ‘color shift’, where red is one of the main stripes and some other color winds up a little smaller in the shifting of the rainbow. After getting some feedback on the first test piece (not the one pictured above), there was a suggestion to reverse the equality effect, so that led to this second pattern, which I call reverse equality (I know, not terribly clever, but it’s descriptive). I did this one two very slightly different ways. In one, the right and left full length pieces are all one piece. In the other, I broke those up in to three. Was a little unsure about stability the first way, and I also sort of liked how the break lines looked on paper in the second one. I am satisfied with both and would make both again. I think I like the one with the end pieces cut in three slightly better than the other, but that’s definitely just a personal preference more than anything else. Measuring 5 1/4″ by 6 1/4″, both versions are solid and stable.